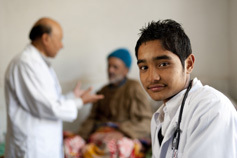 The Nick Simons Institute works to change perceptions and policies that affect the rural healthcare worker. Advocacy and NSI’s other programs complement each other. Advocacy urges policy changes that will augment training and rural staff support. Field work provides ‘on-ground-information’ that makes advocacy credible. Although healthcare workers are essential members of every rural community – and local people realize this – often times the government and general public living in the cities don’t appreciate the role of rural workers nor realize the situations they work under. Creation of adequate numbers of appropriate government posts to complete rural healthcare teams. Development of institutional environment, including management systems, to promote rural healthcare workers’ work. Realization that rural healthcare workers often perform heroic tasks that go un-noticed. Reducing the sense of professional isolation, which is a barrier to effective work. NSI works through a number of mechanisms to advocate for rural healthcare workers: radio, print, and public speaking; worker conferences and newsletters; and knocking on the doors of policy makers.